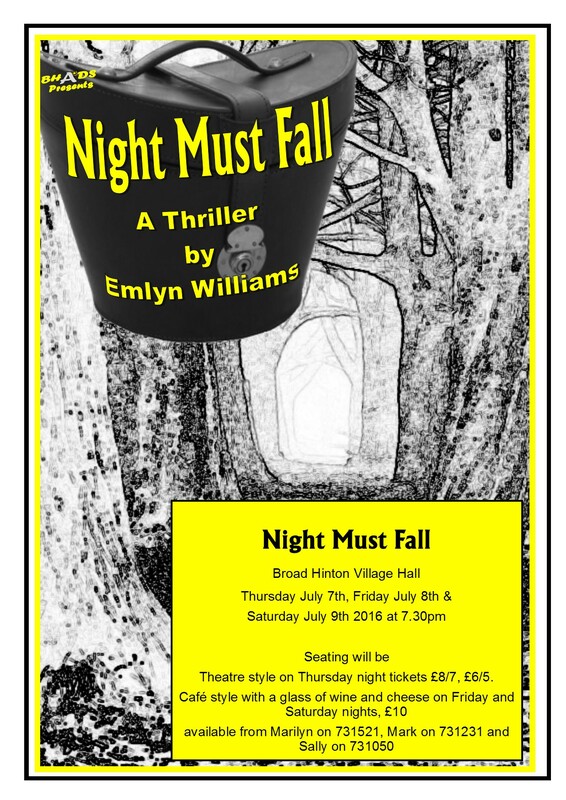 Broad Hinton Amateur Dramatic Society (BHADS) present their summer production, directed by Jane O’Neill. 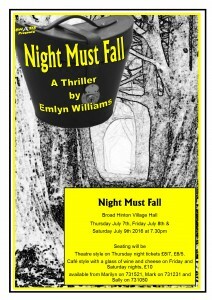 Night Must Fall by Emlyn Williams. This psychological thriller from the master playwright has all the tension, atmosphere and suspicion of the best British mysteries and will leave you on the edge of your seat. Mrs. Bransom hires a charming young man named Danny as a live-in companion. Less charmed by Danny is Mrs. Bransom’s niece Olivia who, when news of a local murder is revealed, suspects Danny. Although repulsed by the thought he may have committed the crime, Olivia finds herself increasingly attracted to him. Come and watch a great cast; Marilyn Martin, Roy Oakshott, Jenni Moseling, Sarah Kromer, Sally Cartwright, Nick Moakes, Paul Thomas, Christine Lawrence and Jerry Marshall.